Known for its unsurpassed accuracy, speed, and ease-of-use, the Surphaser is ideal for rapidly capturing as-built objects of mid-range size including cars, planes, military vehicles, boats, monuments, rooms, buildings, and even people! Applications include reverse engineering, quality control, historical preservation, architecture documentation, and forensic reconstruction. The Surphaser line of scanners incorporates an adaptable user interface to capture specific data areas. And the software exports accurate 3D datasets with little noise to any major post processing software applications such as PolyWorks, Geomagic, Rapidform, Rhino3D, or others. 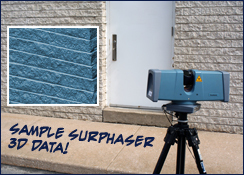 Surphaser products are deployed worldwide, delivering unparalleled precision and value in 3D scanning. Direct Dimensions has performed many demonstration projects with this exciting new tool. No other 3D scanner produces such high quality dense data so quickly! Download sample data sets – the quality speaks for itself.